Stretching over several miles of coral reefs and fine white sand, Barbados is an extraordinary coral island that has positioned itself as one of the topmost holiday destinations in the Caribbean Islands. Consisting of two merged land masses, this Caribbean Island does not lack spectacular rolling hills, gullies, deep ridges, fauna, flora and other wonderful features that are capable of enchanting any tourist. Although Barbados is now a fully civilized island, it has innumerable unsullied underground lakes and caves that have continued to serve as an exceptional source of the purest drinking water imaginable. From its capital city called Bridgetown to Holetown, Oistins, and Speightstown, Barbados has several locations that offer everyone an amazing experience of the Caribbean hospitality. Bajans, as Barbadians are fondly called, are not only friendly, but they are also courteous, warm and welcoming to every tourist. Their one-of-a-kind hospitality is enough reason for everybody to tour this beautiful island. Dedicate time to explore the history, cultures, and traditions of the Bajans while still in this astounding island. Whether your journey has taken you to the West Coast or you are savoring the breezy weather of the East Coast of Barbados, there are endless activities to be engaged in. Enjoy scuba diving and snorkeling on the coral reefs of the coastline of Barbados or be immersed in the entertaining surf as the winds blow gently into your face. Take pleasure in the once-in-a-lifetime experience of swimming with the sea turtles or get the adrenaline rushing with aerial trek zipline, cricket or golf. As you draw curtains on your tour, add culinary adventures to your visit and have a taste of the Bajan cuisines that have always given visitors an unforgettable memory of Barbados. Also, do not be left out of the art, activities, music, and nightlife of this island. If you would like to explore this beautiful Caribbean island, let J & M Belize Travel assist you in making adequate plans for every part of your trip. 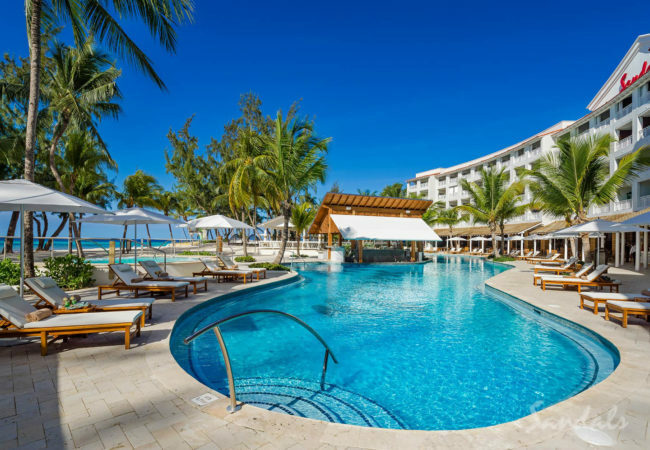 With the help of J & M Belize Travel, a seamless and memorable stay in Barbados awaits you. Dubbed ‘the island’s most popular tour’, this 4×4 jeep safari is a must do! This excursion is a non-stop fun expedition that takes you across the Eastern and Northeastern parts of Barbados. Your skilled guides will navigate you over mixed terrains, on and off-road to some of the best parts of the island all while keeping you entertained with interesting anecdotes, history, culture and the island’s hidden gems. Set sail on a luxury catamaran cruise in Barbados where you’ll journey along the gorgeous crystalline coastline to a tranquil bay. You’ll be greeted upon arrival by a welcome glass of Prosecco from our premium open bar aboard the beautiful Lagoon 500 catamaran. Then sail up the coast to snorkel and swim with the islands renowned turtles and over a shallow shipwreck teeming with brilliantly hued tropical marine life. Sandals Barbados, an all-new retreat in the spirited St. Lawrence Gap area, offers undeniable luxury with inventive accommodations spanning three unique villages.